A new day and a new recipe to share with all of you. Hey, it’s Lunches + Littles again, and today I am sharing a simple dessert that is a little bit sweet, a little bit tangy and packed with a whole lot of fresh lemons and oranges. The citrus says summer. The mint says sophistication. And even though this combination boasts a flavor profile that is perfect for the older crowd, I happen to think that this dessert is just as refreshing for the little ones too, which is something I am always thinking about. If you don’t know this already, I am a mother of three (alllll under the age of 5! ), and so everything I create over on my feed and in guest posts like this one - I strive to create for everyone to enjoy; from toddlers to adults and any and every one in between. 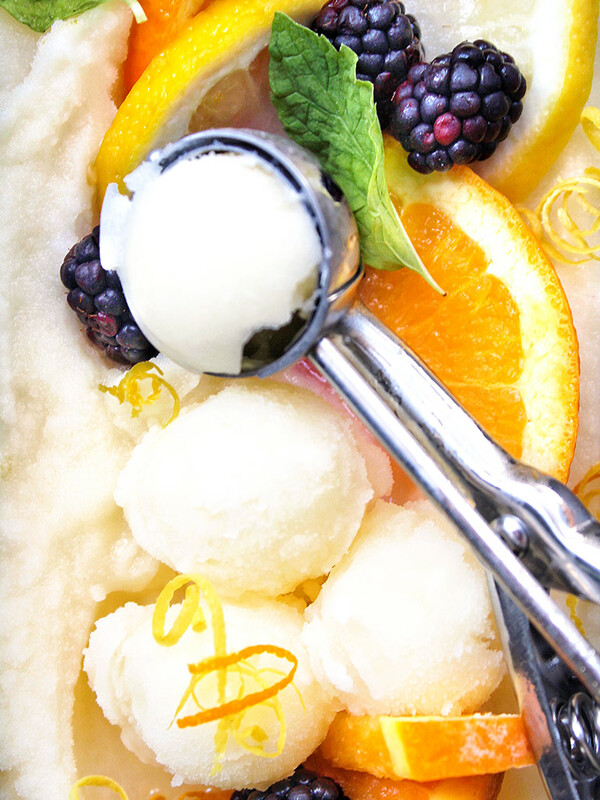 And, I am happy to say that the whole family enjoyed this Citrus Mint Sorbet! It's sooooo refreshing on these hot summer days! Yep. 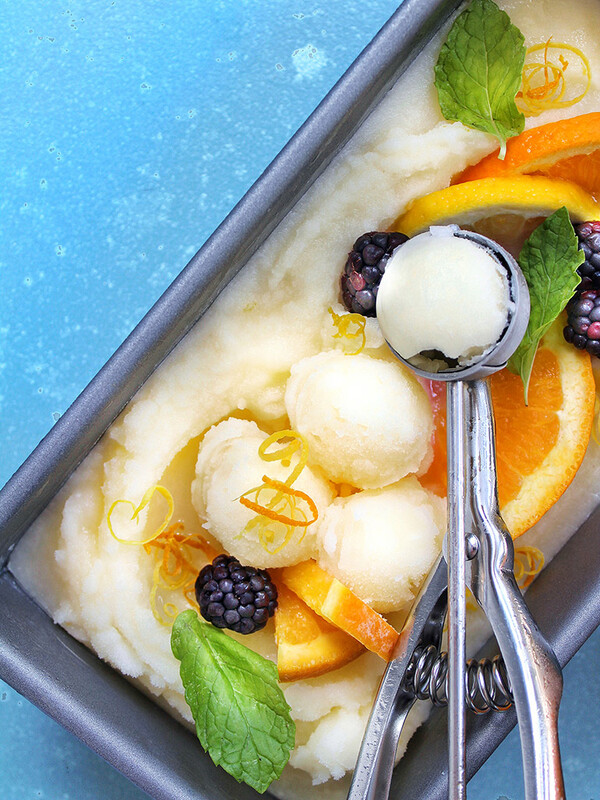 It’s true: we love homemade ice creams and sorbets, and this Citrus Mint Sorbet is great because it is very allergen-friendly and includes minimal ingredients. If dairy is not your thing, this is a great one to try! What I also love about this recipe is that it doesn’t call for things like corn syrup and cups and cups of sugar like some out there do. I have made a version with a light corn syrup that we enjoyed, but I like this version so much better. Icy, yummy flavorful and so refreshing. 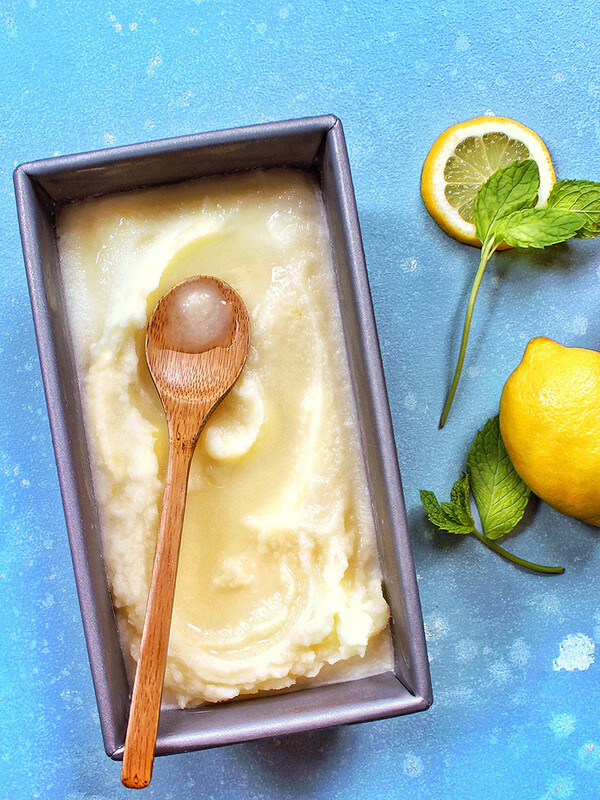 This sorbet is perfect for summer and I love that while it's reminiscent of lemon ice – it has a much richer flavor and is a great compromise between a kid and adult treat. It's such a refreshing, sweet and tangy dessert to enjoy any day of the week. Another plus? – You don’t need an ice-cream maker. 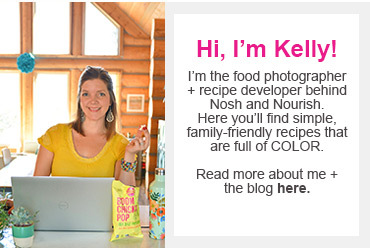 Yep, this recipe can be made with or without one! A quick note about this recipe: I used to be really intimated when I would read recipes that talked about infused or steeped flavors. I honestly don’t know why, but I thought that this was a complicated process. Spoiler alert: it’s not! Maybe just the phrase steeping sounds complicated. I don’t know. But what I do know now is that extracting flavors through the steeping process isn’t just easy, it also allows you to control the depth of flavor you add to a dish or dessert. In this recipe, if you prefer a light touch of mint – simply steep the mint leaves for a shorter amount of time. For a deeper flavor, steep longer. Enjoy!! 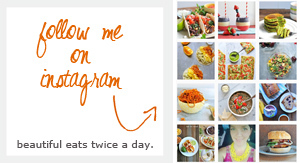 And, be sure to tag @lunchesandlittles and @noshandnourish in this recipe (or any of them!) if you choose to make them yourself. We absolutely love seeing what you are making! In a medium-sized sauce pan combine water, honey and lemon zest. Place sauce pan over medium-high heat and warm until honey has completely dissolved. Then, remove from heat and set aside. Next, add mint leaves to the mixture and stir to combine. Then, allow mixture to steep for approximately 10 minutes. After 10 minutes taste test the mixture. If mint flavor is where you’d like, remove from stovetop, strain mixture and set aside. If you desire a richer mint flavor, simply allow to steep for an additional 5- 10 minutes. Be careful to keep checking/tasting to ensure you don’t get too strong of a mint flavor. Stir in lemon juice and fresh squeezed orange juice. Next, transfer mixture to an airtight container and place in refrigerator until completely chilled; 1 and 1/2 - 2 hours. Once fully chilled, transfer the liquid mixture to an ice cream maker and churn according to the manufacturer’s instructions. *If you do not have an ice cream maker – that is okay. Simply pour your chilled liquid mixture into a freezer safe container (I use a metal loaf pan as shown) and freeze a total of 2 to 3 hours, mixing with a fork periodically (every 30 min. or so). This takes a little planning on your part but is totally doable! If you did use an ice cream maker above, once the mixture is churned, transfer to a freezer safe container/metal loaf pan and freeze until sorbet reaches desired consistency. Scoop and serve. Top with fresh blackberries, orange wedges, etc. as shown, if desired. Another really fun way to serve this treat is to serve the sorbet right inside the halved/juiced lemons. These emptied out lemons make the perfect sized bowls for little hands.